This Hertfordshire Venue based in Welwyn Garden City is an exclusive venue for weddings, parties & corporate events. The venue is close to London and easy to reach by car or public transport whilst still boasting the breath taking views of the Hertfordshire Countryside. The exceptional meeting facilities are frequently used by business men and women, politicians and captains of industry’s as it provides a discrete and luxury place to meet. The beautiful Regency stately home also boasts 30 state of the art luxury bedrooms which are individually decorated with a quintessentially British look whilst still being every bit modern. All of the suites are finished with oil paintings, period antiques and stunning wallpapers to make your stay 5 star. For weddings you have several options depending on the size of your party, the magnificent ballroom can cater for up to 200 guests and each element of your day will be personalised to the couple. Brocket Hall only takes one booking open day so you and your guests would have exclusivity of the whole house. 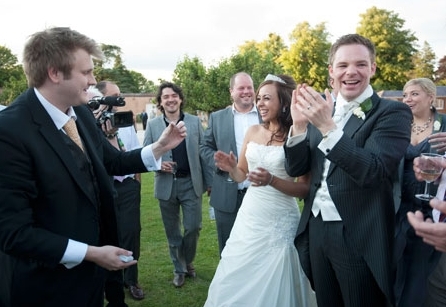 Chris was honoured to be invited to perform some mix & mingle Magic at Joanne & Paul’s special day at Brocket Hall. The 70 guests thoroughly enjoyed themselves as did the happy couple. Mix and mingle magic is always a great way to brighten up your wedding reception. It’s a guaranteed way to ensure that your wedding guests are happy and entertained which leaves the newlyweds to be able to enjoy the night themselves as they wish. Hiring a magician for your wedding helps to break the ice between groups of different families and friends and usually results in one large unified group of guests laughing and joking together. If you would like to find out more about how Chris can make your special day even more magical get in contact today on 07747141238.